Lynden Blake talks with two basketball players who went to high school together at Madison Academy. Happening now... we're just 24 hours away from tipoff for the auburn tigers! The team's been in minnesota all week getting ready for the big game! That's where we find waay 31 sports director lynden blake! Lynden -- i hear you have a special final four connection..
Joshua langford describes myles parker as his little bro. "i remember when i first met him when he came to my high school, we played two years together." 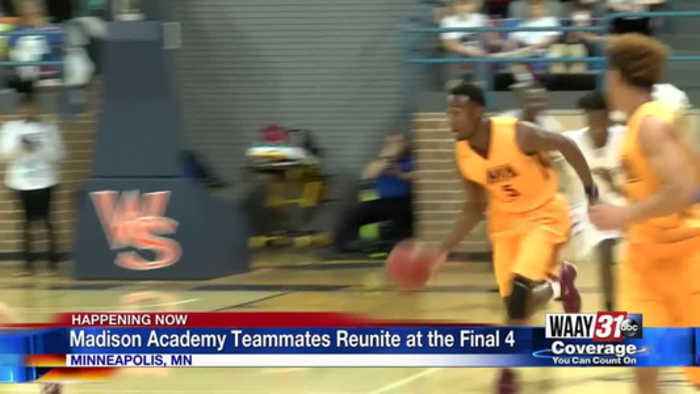 "josh is one of my best friends, playing with someone you like is always cool" now the two are in the twin cities for the final four. "i saw him at the fan fest thing, it was good seeing him." The auburn freshman credits joshua with teaching him how to shoot. "me coach blackston, we all use to shoot together." "i tried to tell him what i knew about the game, he's really reception and wants to be a better player and better person." Joshua was one of the top recruits in the country. Making basketball practice interesting in madison. "i saw josh's whole recruitment so i saw bill self, billy donovan, all of them came through madison academy." Joshua plays under the hall- of-fame coach, tim izzo, still, he credits his high school coach, andy blackston with building him a foundation to succeed at the college level. "really a lot on the court, but off the court, just with my faith and with god and how a man of god should carry himself." Auburn and michigan are on opposite sides of the bracket. If the teams win, we'll have a mustang showdown for the title. "hopefully if it plays right, we'll be able to play each other in the championship."